While most everybody seems to have shifted from Bethesda's open world to The Old Republic's - at least in The Escapist offices - I still have a lot left to do in Skyrim. 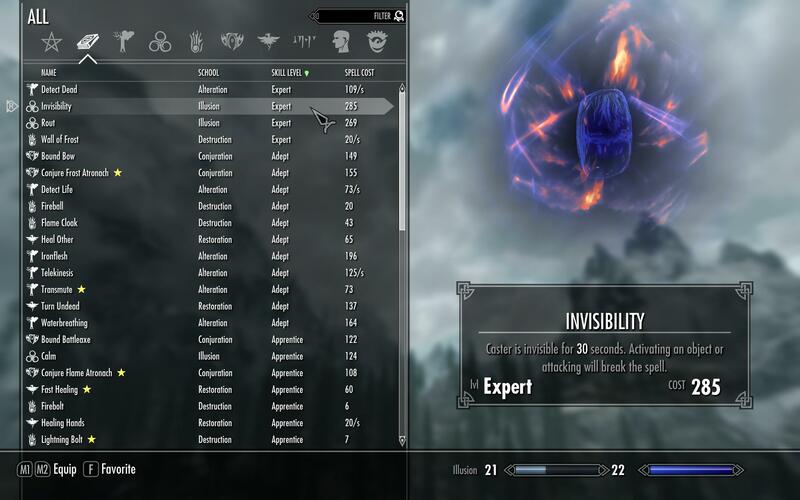 Not the least of the quests I've undertaken is to craft a perfect user experience cobbled together from the plethora of mods available at sites like SkyrimNexus.com. Note: As before, I still haven't dabbled in mods that significantly alter the game assets or rules of the game. I don't like god items or added quests or tricked out houses; the game world as Bethesda's staff designed is what I want to play through. I don't have a problem improving the graphics or the abysmal interface to make the game more enjoyable. So while I get a snicker out of Macho Man Randy Savage and Dr. Zoidberg as a mudcrab, they are not going to end up in my Skyrim. Gone are the uninformative lists of alphabetical items and in their place are beautifully simple icons separating each category. 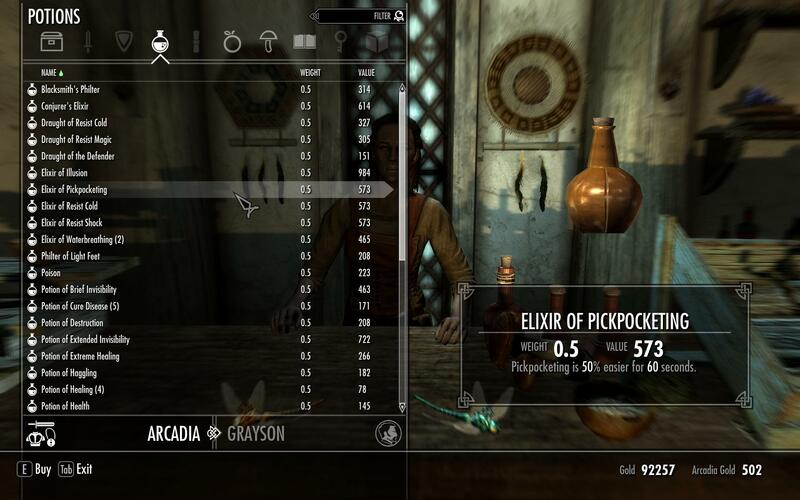 SkyUI 1.0 let you sort these columns before, but only when you opened the inventory window, leaving the default interface there when you looted bodies or talked to a merchant. 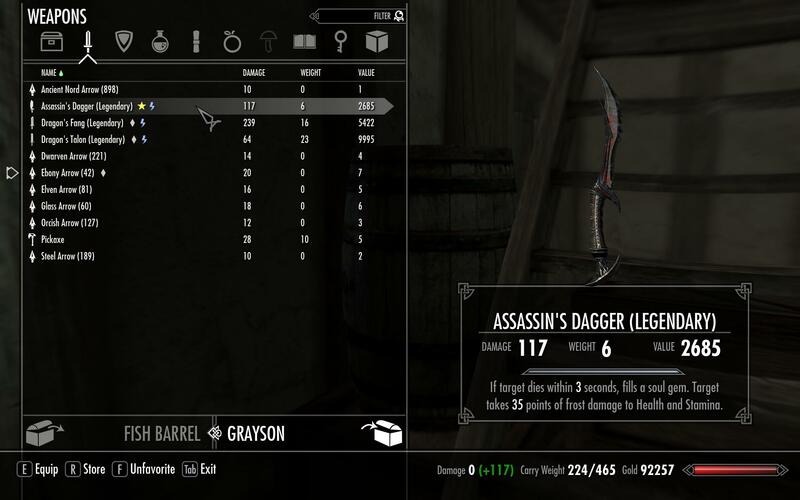 SkyUI Version 2.0 now governs all of your inventory, allowing you to sort by stat, value, weight, and the elusive sabermetric value/weight. 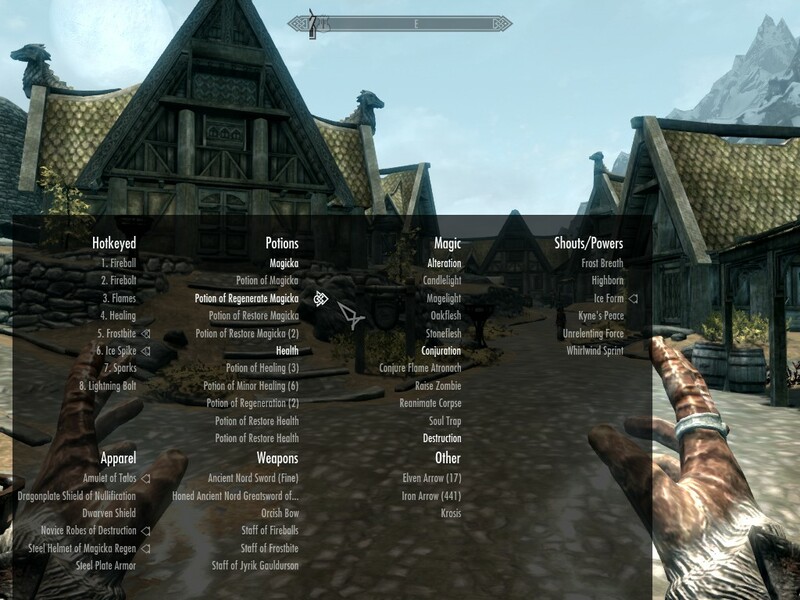 In addition, the new version alters the troubling default magic menu to offer a lot of the same functionality. The different schools of magic each have an icon at the top so you can quickly skip around, and SkyUI's magic menu even lets you sort dragon shouts by recovery time or level. 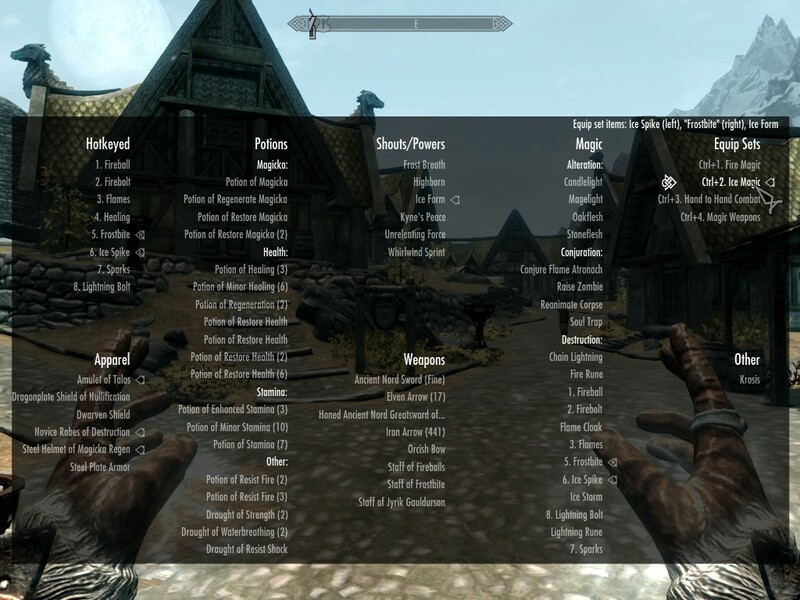 SkyUI needs an up-to-date version of the SKSE script extender to work perfectly, so you basically have to maintain two mods to keep it working. But honestly, a user interface designed for use with the mouse and keyboard is worth the extra hassle, especially now that version 2.0 is basically feature complete. 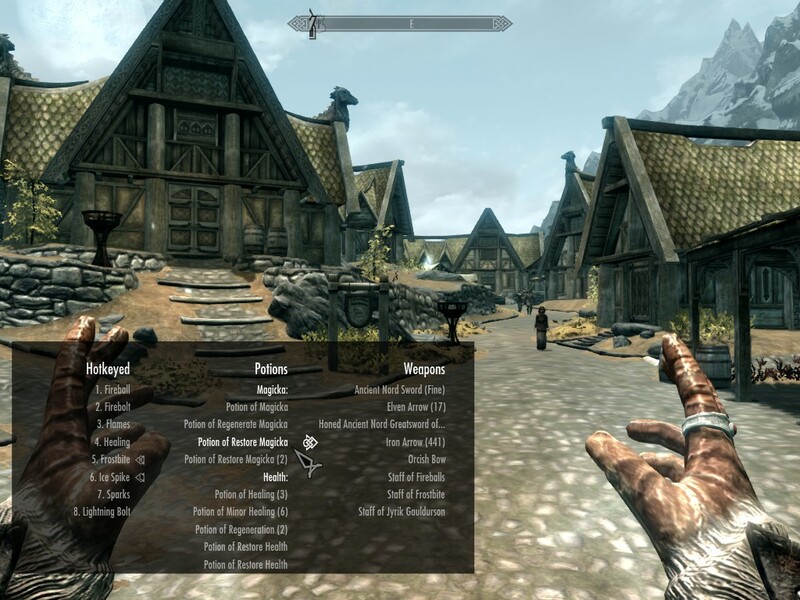 The single column favorites menu that came default in Skyrim is a necessity when playing with a controller, but the mouse offers so much more control than a silly gamepad. 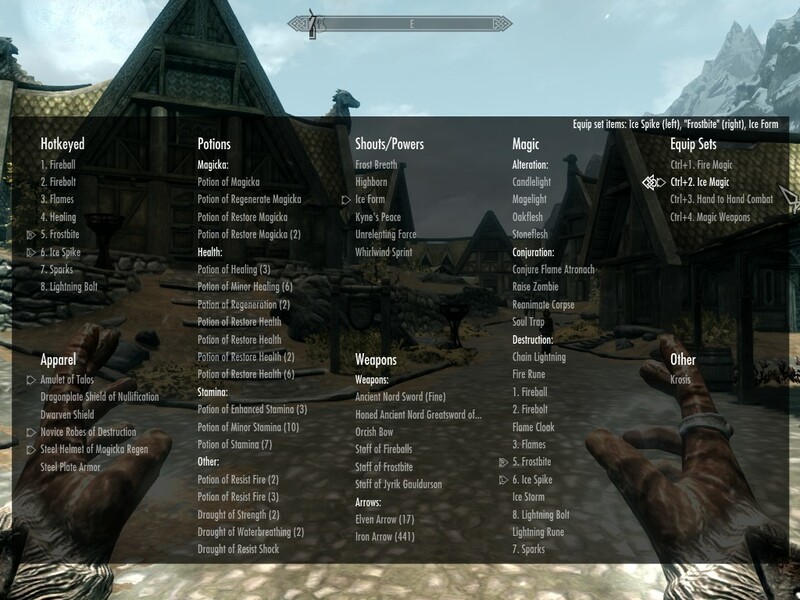 As I progressed through the plot and acquired more spells and potions, I ended up scrolling my favorites list incessantly looking for Fireball or my Dwarven Bow. The funny thing is, I didn't even realize how much of a pain the favorites menu was until I saw Categorized Favorites Menu from the aptly nicknamed author "favmenumodder". CFM offers a pane of configurable panels when you press Q (or whatever you have hotkeyed to bring up favorites). These panels have default positions for magic spells, potions or powers you have favorited and it's a great help to have them all available at a glance instead of being forced to scroll. But even if you have more spells in the magic pane than can be displayed, you can scroll that list independently of the list. It's really just icing on the sweetroll that it's further categorized by school of magic. I haven't delved into configuring my favorites panel, but "favmenumodder" has provided instructions on how to do so by altering the accompanying favoritesmenu.cfg file. One interesting, but experimental, feature is the ability to swap out more than one piece of equipment with one click through creating item sets. Once I have some time - and a need to swap into fire resist gear - I'll fiddle with this feature to see if it works as advertised. Even better, as of the latest version of both mods, Categorized Favorites Menu is compatible with Better Sorting by GaÃ«tan Landry. At first, the conflict was kind of a dealbreaker for me, but now CFM will display correctly with the new item names in Better Sorting. Score! Download Categorized Favorites Menu here.